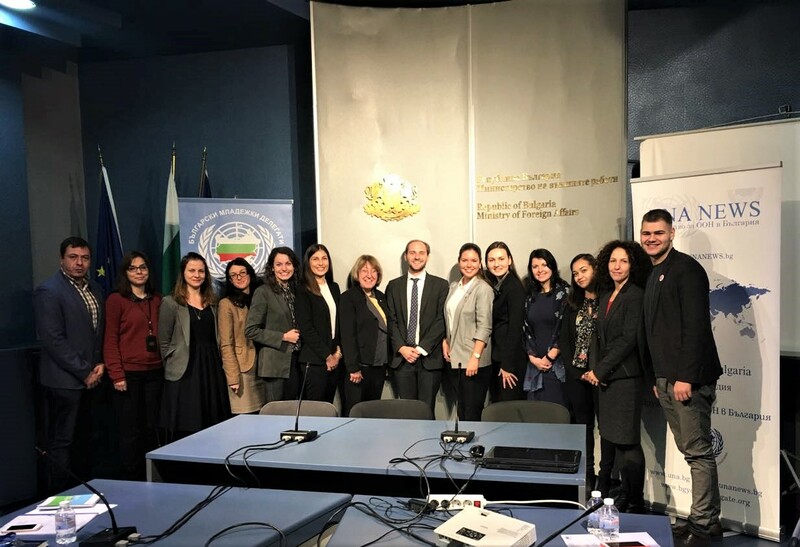 Today the Bulgarian youth delegates to the UN presented their activities and initiatives for the past year on an international, national and local level during a briefing at the Ministry of Foreign Affairs. 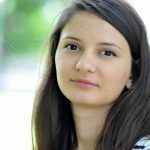 “Bulgaria has ten years of tradition of including young people in decision making processes on the highest level. Countries like Spain and Italy seek our experience and borrow good practices from us. This is possible due to the good cooperation between NGOs and institutions in the country. There is no other program in the world with such a tough procedure for selecting youth delegates to the UN”, the program coordinator Alexandra Mircheva shared this with partners from institutions and the non-governmental field. In the briefing at the Ministry of Foreign Affairs diplomats and representatives of resource directions in the ministry took part as well as experts from the Diplomatic Institute of the minister of foreign affairs, representatives of the board at the UN Association in Bulgaria and partners from non-governmental and youth organizations – National Youth Forum and Association for Supporting Academic Societies. 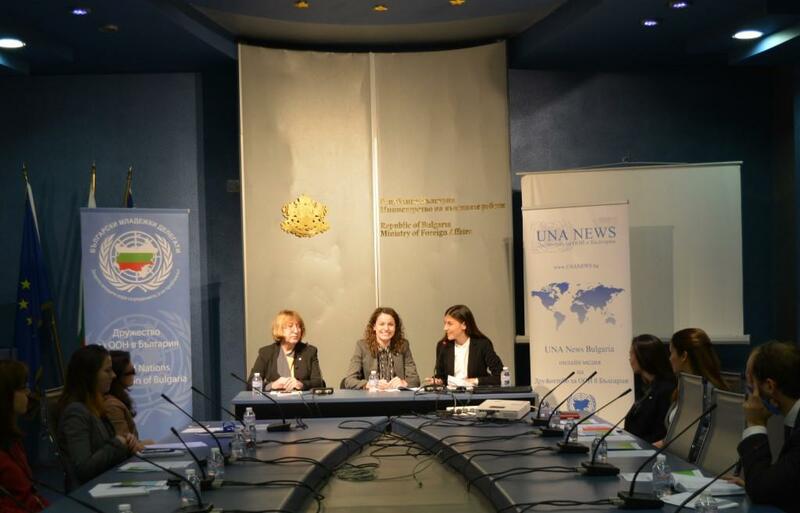 Alexandra Mircheva and Iva Tsolova, youth delegates with mandate 2016-2017 and Assya Pandzharova and Ralitsa Dikanska with mandate 2017-2018 pointed out the working visits within the UN as well as the events organized in Bulgaria over the past year. Alexandra Mircheva and Iva Tsolova’s speech was focused on the campaign “17 goals for 2017”. “It’s important for us to make Program 2030 accessible and understandable for everyone. We aim to show young people that the fulfillment of the Goals for sustainable development starts with the individual. 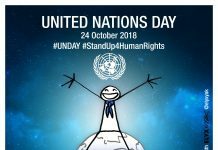 Everyone can join in the implementation of the new agenda for sustainable world development of the UN with many small personal decisions how to live, how to dispose of their garbage, how to go to school, university, work”, the youth delegates said and added that change starts first from people’s minds. 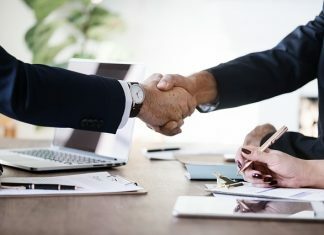 The campaign is being conducted under the patronage of the Ministry of Foreign Affairs and aims to spread the Goals for Sustainable Development by engaging a wide circle of interested parties, but especially youth with the implementation of those Goals. Alexandra and Iva introduced the attendees to their tour around 8 Bulgarian towns where they reached youngsters from the whole country. They shared results from their visit with the Commission for Social Development at the Economic and Social Council of the UN and their work on the Youth resolution as well as their participation in different international forums in their capacity as youth delegates to the UN. 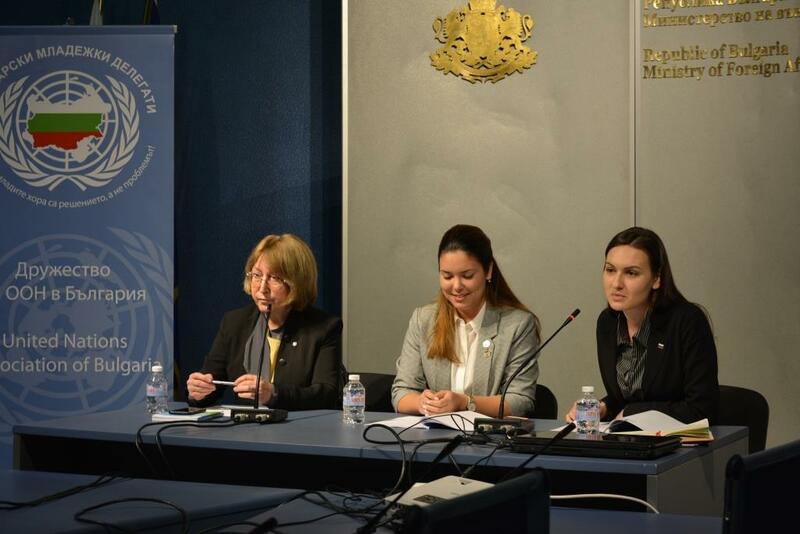 Assya Pandzharova and Ralitsa Dikanska shared more about their participation in the Third Committee on social, humanitarian and cultural matters where immediately after its opening they held a speech on behalf of the Bulgarian youth. 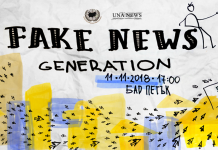 The speech is based on previously held online research aimed at current questions and challenges in front of youngsters in Bulgaria. “Sport contributes to personal development and skills of young people and the intercultural dialogue plays an important role for the social progress and inclusion of young people in society”, Ralitsa Dikanska said presenting the priority topics of the youth delegates. In their speech they mentioned the topics of sport and intercultural dialogue like means for providing skills for overcoming youth unemployment. The delegates presented the event organized alongside their colleagues from three different countries within the working visit at the UN focused on tools and approaches for solving the problem with high levels of youth unemployment and how non-formal education helps this process. 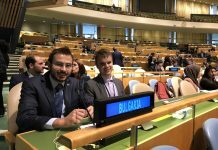 The Bulgarian youth delegates for 2017/2018 managed to share main points from their two-week work visit in New York one of which was the negotiations on the new Youth resolution with the support by the Permanent Representation of the Republic of Bulgaria to the UN. During their visit the delegates took part in youth events as well as in meetings with the World Federation of United Nations Associations. Traditionally the youth delegates from around the world are being accepted by Secretary-General of the UN António Guterres as well as by the UN Secretary-General’s Envoy on Youth – Jayathma Wickramanayake. Assya and Ralitsa talked about their work on national level after their return from their working visit in New York. They shared more about the planned campaigns and initiatives for 2018 for implementation of their priorities – intercultural dialogue, sport and promoting the Goals for Sustainable Development.